Beauvoir: After the Storm . . .
Today, I took a tour of Beauvoir, and I can see why the Davis family loved this place. The well-trained staff at Beauvoir were helpful, and you can tell by talking to them that they all have a deep passion, intense knowledge of, and a reverence for this place. I signed the books of mine (Jim Limber) that are there, and had a grand time. Though the site has been formerly rededicated, there is still some restoration going on. The storm that came through Biloxi must have had the meanness and destructive power of Sherman’s bummers. Signs of the storm are everywhere in that area, and Biloxi still has a long way to go before we could say the area has fully recovered. The most interesting fact I learned: Oscar Wilde (and other significant literary characters) had visited the Davis family. That is a story I must pursue. I also managed to do some more research on Jim Limber. I’ll talk about my findings in a future post. 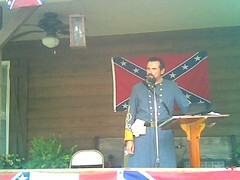 Here are two more photos of Saturday’s celebration of General Nathan Bedford Forrest’s birthday. The first is of a man who takes on the General Forrest persona (and does so effectively, both in spirit and in looks). The resemblance to the past General Forrest is so startling, that one begins to think he is indeed an incarnation. 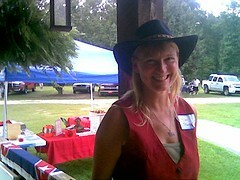 The second is of Kim Shannon, a beautiful singer of Confederate songs. She and I alternated spots for the Forrest progarm, played some songs together, and I was most impressed with her voice and with her love of the South. I’ll have more to say of this talented lady later. Tomorrow morning, I’ll be interviewed on KLPC TV here in Lake Charles. The next two days will be spent presenting programs, songs, and stories to the libraries in Cameron Parish. I’ll report on my blog as I can.